Last week we posted about the Sustainability Challenge we're taking part in. After a week full of reflection and research, this past (almost) two weeks, we've gone head on towards living a somewhat different life. The biggest challenge we set ourselves was to live waste free and although it has made us think LOTS, it hasn't been as difficult as we expected. And there have been some pretty awesome discoveries along the way. There are a few definitions out there of what zero waste means. For us, it means bringing nothing into our home that we can't consume, compost or repurpose. It means not contributing to landfill, or to giant floating islands of plastic. It means little to no recycling and refusing biodegradable plastics too. Recycling can mean a portion of our waste is moved to local depots where it is sorted, often added back to landfill, or moved on and sold to companies who purchase and re-purpose it as a raw product. For plastics, this means a downgrade. So a milk bottle doesn't become a new milk bottle, it becomes something else and eventually ends up in our system as a single-use plastic item. That's a whole lot of plastic for the earth to digest. Biodegradable means the plastic breaks up into tiny particles, still floating around, polluting our water and soils. So for us, this challenge means not being complacent about where our waste and recycling goes. It means thinking. Lots of thinking. And refusing what we can't put to good use. We want to take responsibility for everything we bring into our home. But rather than focusing on the zero in the whole equation, the refusal, we're choosing to focus on what we can use, and how. Instead of asking is it landfill, or is it waste, we're asking "Is it compostable?" Earth is losing soil at a rapid rate, so anything we can do to help build it up is hugely valuable. Making choices that help us build up the soil in this little patch of land we're care-taking is important. And we've only scratched the surface. Remembering the shopping bags, stashing extras in our bags, pockets and car, just in case. Shopping at bulk foods stores and taking our jars along. Using lightweight cloth bags for produce. Taking containers along to a butcher/fishmonger to place meat, poultry or fish in. If we're caught short, paper bags are acceptable for us - we can compost them or use them for heat. When eating out, taking our own chopsticks along and finding take away food available in paper or compostable packaging and bringing it home to compost. Making our own toothpaste and cleaning products. Using compostable, wooden toothbrushes and cleaning brushes. Using cloth everything. From hankies, to family cloth (although guests have an ethical, recycled flushable toilet paper option!). Knitting our own kitchen cloths. This one is made from an old t-shirt. Composting everything we sweep up or vacuum. Compost heaps don't mind dust. Remembering to compost the dog and cat poo in the special pet waste worm farm, rather than throw it out in a plastic bag into landfill - yuck! Making our own pet food. Getting our ferments happening again. Getting our yoghurt and cheese making act together. Using and making home made seaweed tea for the garden. Learning more about the plants we grow and expanding our medicinal herb garden. Re-evaluating the processes in our business. Produce without stickers is hard to find! This is why growing our own is important. Dairy is almost always packaged in plastic, foil, or coated cardboard. We're having to compromise by bringing home only what we can repurpose. We're allowing ourselves a maximum of 3L of fresh milk each week and repurposing the packaging to make things we can use in our garden, like seedling containers and plant tags. We have powdered organic milk as back-up too. Our dairy consumption has dropped dramatically, which is a good thing environmentally too as it takes about 1000L of water to make 1L of milk. When our beloved Elgaar dairy is back up and running in a few months, we'll be happily drinking ethically produced milk and using reusable glass instead. Shop assistants may try to help, but not quite understand what we're doing here. Like the butcher who was happy to sell us a plastic-free chicken - once he'd removed it from the bag. Or the cheese seller who we suspect may have just removed the glad wrap, rather than cutting a fresh slice of parmesan for us. You need to be on the ball when shopping. In Tasmania, we don't really have a one-stop shop where we can buy everything under one roof. We're travelling to the whole foods shop, the butcher, the farmer's market… We're using the car a little more and being conscious of fitting more into each car trip. We need to look into whether bike or bus travel are viable options for our whole family. At the moment, for a family of five, the car is coming out on top as the best use of energy, money and time. Shopping in small whole foods shops with multiple children is challenging! We tend to all pile up on each other and cause traffic jams by the quinoa. We're thinking of frequenting a smaller shop with a garden where we can park the owlets for a moment while we shop. We're getting better each time we do it. Carrying all the jars is pretty heavy and requires preparation. But once you've done it a few times, it gets easier. Medicines, vitamins, bandaids, hardware, gardening products, postage products… even sustainable products like compostable tableware… are all wrapped in plastic. Even the food that we've bought at the whole foods shop has most likely been wrapped in plastic at some point. Our lives are so tangled up in it. So, we work harder to consume a diet that doesn't require supplementing or medicating. We take our own tableware along. We make our own and we find the very best alternatives we can, when we can. If we can't we're going to ask businesses to think about their practices and re-examine just as we are doing. Plastics and packaging create convenience that keeps a whole lot of industries in business, so we can keep them accountable by asking them to change their practices, choosing alternatives or creating our own. Traveling and frequenting different shops means we're engaging with our community a bit more. We're having conversations with real people and finding out more about where our food comes from. Which is a definite win. We're more mindful of what comes into our home. There's no waste to deal with. We're saving time and life's getting simpler. Its feeding into other areas of our lives where we're thinking more minimally. When we unpack the shopping, it's already in the jars we intend to keep it in for freshness, so we just pop it straight in the cupboard, fridge or on the bench. It saves time! Plus jars are kind of lovely food storage. Food tends to be healthier. Even though we cooked mostly from scratch before and our diets haven't changed hugely, I'd say the way we value our food has changed and we're definitely focussed on the good stuff. Shopping is more enjoyable. It's quicker. There are fewer choices and fewer decisions to make. There is no advertising or excess packaging to deal with. Once you've got it sussed, it saves you lots of time and it's generally more pleasant. We thought shopping this way would be more expensive. We're still trying to tally all the exact sums on that, but so far it's not! We have managed to stick to budget and feed ourselves well. We've found there's actually savings to be made on certain items we've always bought. And we're not paying for packaging which makes up part of the cost of most pre-packaged foods. Awesome. Well, before we began this challenge, we put all the items that came in non-refillable containers into lockdown. We were fortunate that it began at the end of a pay cycle, so the fridge and cupboards were absolutely empty, so much of our waste had already left the building. Things like shampoo bottles and tea bag packets remained unfinished. Things we could replace with a more ethical, compostable version. Now we've replaced them, and know it's easy enough to live without them, we'll phase them out completely. So we'll be filling our rubbish and recycling bins one more time. We may even hire a small skip for some bits and pieces we really can't repurpose, sell or give away. Decisions we made earlier that we wouldn't make again now. And we'll be letting them go, learning and moving on. Now we know our version of zero-waste is totally achievable, and actually not as huge a leap as we first thought, we'll be continuing along this path from now on. We'll be making changes to Spiral Garden, which remove the need for our customers to worry about this stuff, as much as we can. We'll be thinking about how Christmas and birthdays might look for our family over the next few months. We'll be composting and gardening and thinking about some of the other things we might change too, staying positive that every tiny change we make is a step in the right direction for our planet. It's all a bit of an adventure! Have you ever given much thought to waste, or a zero-waste lifestyle? If you have any questions, we'd be happy to answer them. Have a gorgeous week, whatever adventures you're on! UPDATE! 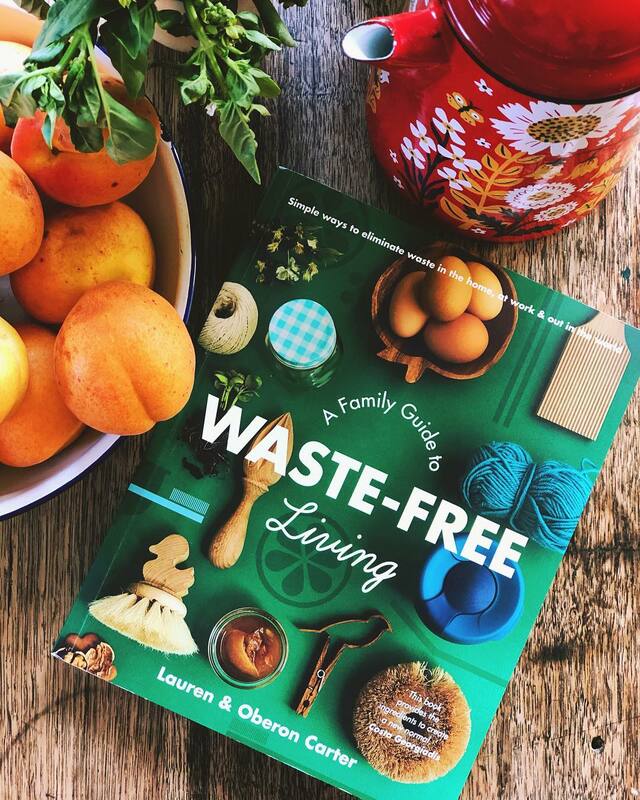 We've learnt so much more in our zero waste adventures since this post was written and we've decided to share lots of that information in a supportive and fun space in our new e-course at zerowastefamilies.com! Join us for four weeks as we help you move towards zero waste living. It's hard to change when the throw-away world is everywhere. I decided to buy my bread from the bakers rather than from the supermarket as I figured it would be healthier then I realised that the shop assistants used a disposable plastic glove for every customer & each time the gloves get tossed into the bin and a new one used. WHAT?? WHY?? So I gave that up as I couldn't stand to see all that plastic going to waste, so now I buy bread from the supermarket again but changed brands & type -- yes, I do make my own bread too but I have a 4yo & a 2 yo & they don't like the crusts of the homemade bread! This post really stuck with me Lauren, I have been thinking about it for a few days. We live a pretty waste free lifestyle and find it relatively easy - being frugal bees and making nearly everything from scratch - but we both work for ourselves and it's much harder when you're trying to operate a small business. Ceramic glaze comes in plastic, hardware comes in plastic (well, mostly - and it's often those things we can't afford not to buy, in order to finish a job). Graphic design is pretty minimal on my end as I just use my trusty old computer, but the stuff I make is sometimes turned into physical posters, cards, flyers that end up god knows where. I also manage my landlords Airbnb (as a rent discount) and the amount of rubbish that gets left behind is scary! So, I need to think a little more about the business side of things. I also bought up the idea of family cloth over ice cream yesterday, but didn't get such a positive response from my partner. We're all over the humanure (we just planted out our cider orchard in the beautiful stuff), but for some reason family cloth gets a little face scrunch. He did remark something about pulling corn chunks out of the washing machine filter, oh dear hehe! Someone else using cloth for toilet paper too!!! We buy all our dry goods in bulk 20kg bags (this is how the store gets it and then puts it our for you to buy 'loose'. There is still a bag. Paper for flour and oats, plastic for everything else, but we re-use these 20kg sized bags for other things. It costs much less too. You guys are so inspiring. Keep it up! Can't wait to hear more about what you are doing.